The city of Vienna spent the second half of the 19th century in the midst of urban renewal. Following demolition of most of the old city wall and its bastions, the area where these fortifications had once stood became the most significant construction site of that era. Under Emperor Franz Josef I (who reigned from 1848 to 1916), the period beginning roughly in 1860 saw the construction of a new boulevard which encircled the inner city like a ring - hence the name Ringstraße, or Ring Road. Along this magnificent circular route, important architects put up major representational buildings including the Austrian Parliament, Vienna City Hall and the so-called "New Castle" [Neue Burg] addition to the Hofburg Palace, as well as museums, the Burgtheater, numerous palaces and even a church [Votivkirche]. In terms of stylistic history, most of these buildings can be characterised as neoclassicist. The historicist construction undertaken included styles such as neo-Gothic (City Hall, the Votivkirche), neo-Renaissance (Court Opera, University), neo-Baroque (the Burgtheater) and even Greek Revival (Parliament). The most important architects working along the Ringstraße were Gottfried Semper, Theophil Hansen, Carl von Hasenauer, August Sicard von Sicardsburg and Eduard van der Nüll. The Ringstraße architects' most famous student was Otto Wagner (1841-1918). 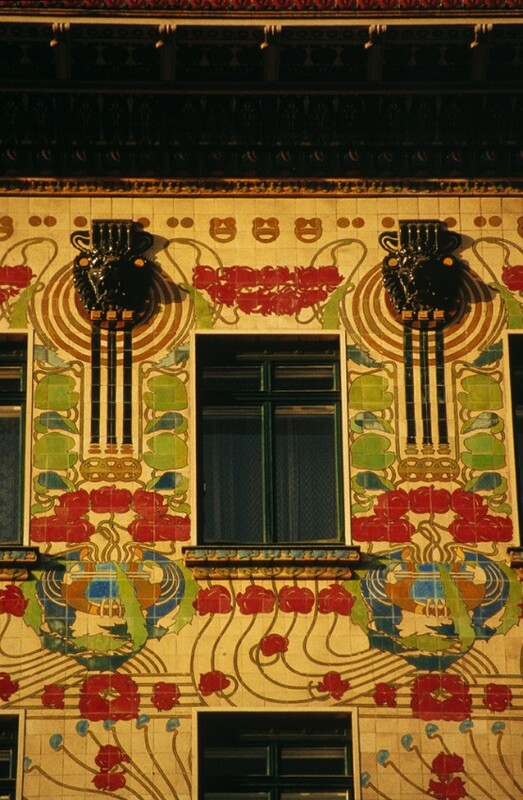 Wagner was also the central architect of Vienna's Jugendstil or Art Nouveau period. His most important buildings are the AnkerHaus in the Graben (1st district, 1895), his two villas (19th district, 1888 and 1911), the buildings on LinkeWienzeile (6th district, 1898/99), the Postsparkasse [Postal Bank] building (1st district, 1906) and the Kirche am Steinhof [Church of St. Leopold, Steinhof] (14th district, 1907). After initially having employed historicist forms, the period around 1900 saw Wagner begin producing designs that were increasingly stark and sober. The surface now governed ornamentation, some of which was designed to give an impression of pure functionality. The use of novel materials such as aluminium and steel-reinforced concrete was joined by outwardly visible details such as the marble slabs on the façade of the Postsparkasse building, which seem to be fastened to the wall with rivets. In reality, these elements are simply embedded in stucco. Here, Wagner was paving the way to New Objectivity, applying the idea of using the construction material itself as a decorative element. 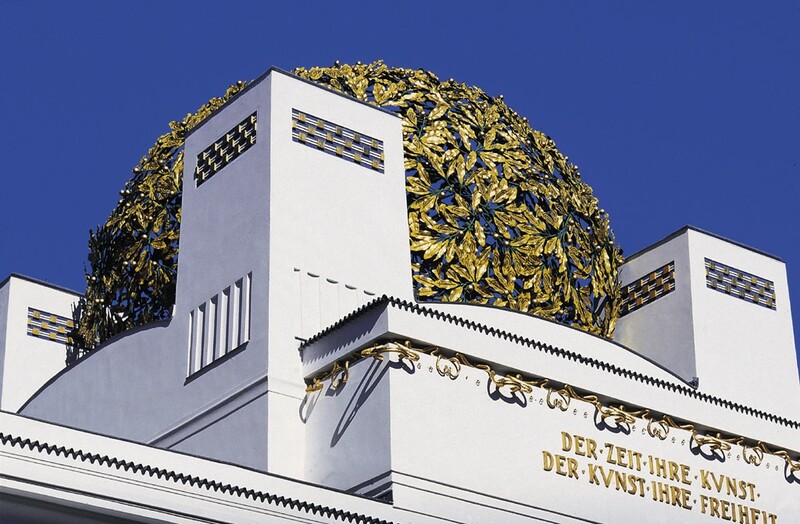 The two probably best-known pupils of Otto Wagner were themselves to become outstanding Jugendstil architects: Joseph Maria Olbrich (1867-1908) and Josef Hoffmann (1870-1956). Olbrich was Wagner's favourite pupil, and his outstanding talent as a draughtsman makes it likely that a great many of Wagner's designs that have come down to us are actually works by Olbrich. 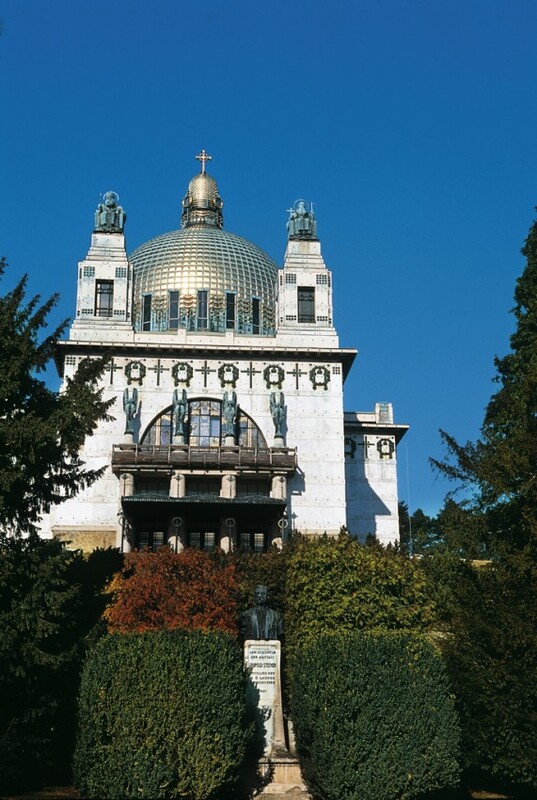 As for Olbrich's own buildings, even his very first was to become an icon of European architecture: the building of the Vienna Secession, the "Union of Austrian Artists". This 1897 structure served as a headquarters and exhibition location for this association of avant-garde artists, the founders of which included Gustav Klimt and Kolo Moser. With this building, the group - comprised of artists who had left the Vienna Künstlerhaus organisation (the Austrian Artists' Society) - had erected a strong symbol of modernism not far from the Naschmarkt and the Baroque Karlskirche, in a Vienna that was strongly characterised by historicist styles. This white building is topped by a golden laurel dome which shines far and wide. Above the entrance, the motto of the Secession - "To every age its art, to art its freedom" (Ludwig Hevesi) - testifies to the progressive stance of this artists' collective. The other motto on the façade, the Latin words Ver Sacrum (holy spring), hails the beginning of a new spring for art. The official periodical of the Secession likewise bears the title Ver Sacrum. Olbrich also designed the clubhouse of the Radfahrclub der k.u.k. Staatsbeamten [Bicycling Association of State and Court Civil Servants]. Another important Wagner pupil, on the other hand, remained in Vienna: Josef Hoffmann. Hoffmann's buildings are characterised by a cube-like style. Hoffmann was not only a founding member of the Secession, but also co-founder of a pioneering design group - the Wiener Werkstätte - together with Kolo Moser and Fritz Wärndorfer at the beginning of the 20th century. The trademark used by Hoffmann in his design sketches was the square. In Vienna, buildings created by Hoffmann included the villas of artist-colleagues Carl Moll and Kolo Moser in the HoheWarte neighbourhood of the 19th district, the Ast House (19th district) and Villa Skiwa-Primavesi (13th district). 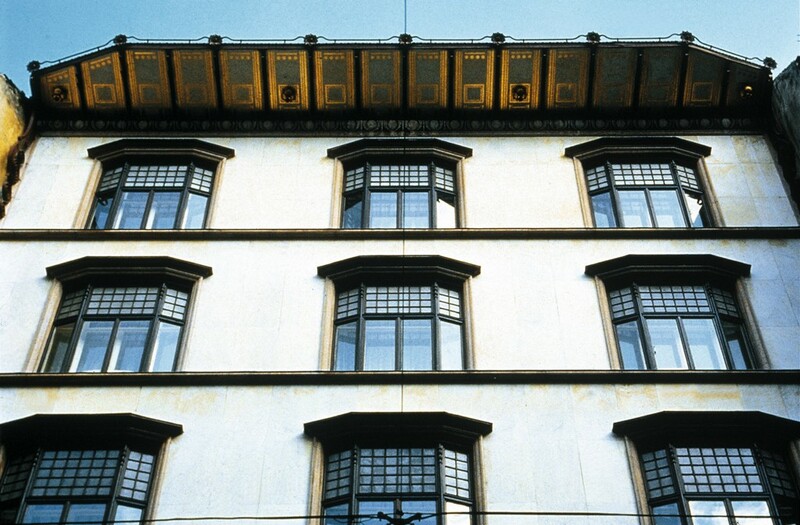 Many no-longer-extant structures by Hoffmann such as a shop of the Wiener Werkstätte (1st district), the Grabencafé (1st district) and the Austrian Pavilion for the International Art Exhibition in Rome (1911), bear witness to the breadth of his creative work. Exceptional contributions to Viennese Art Nouveau were also made by Max Fabiani (1865-1962) and JožePlečnik (1872-1957), both of whom also worked for Otto Wagner. Fabiani created buildings including one for the company Portois & Fix (1897-1900). Portois & Fix was the most important interior decorating and furniture building company in Vienna, with subsidiaries in Cairo, Constantinople, Bombay and elsewhere) on Ungargasse (3rd district). He also designed the Artaria building (1900-02) on Kohlmarkt for the longstanding music shop Artaria, as well as the building of the continuing education association Urania, which included an observatory (1909-10, both in the 1st district). The studio of architects Josef Hackhofer (1863-1917) and Friedrich Ohmann (1858-1927) designed bridges across the Wien River in and around the Stadtpark (1899-1900), covered over parts of the Wien River (1903-1906) and also put up the Meierei (a so-called "milk-drinking hall") in the Stadtpark (1901-1903). Hackhofer himself was responsible for the HoheBrücke [HighBridge] over the street TieferGraben (1903-1904) in the 1st district, as well as for the Scheid villa. Ohmann, whose oeuvre brought together Art Nouveau and neo-Baroque influences, oversaw the construction of the Neue Burg section of the Vienna Hofburg and also built structures including the Palmenhaus in the adjoining Burggarten (1901), the monument to Empress Elisabeth in the Volksgarten (1904-1907), today's museum in Bad Deutsch-Altenburg (Carnuntum) and Villa Regenstreif (1914-1916). The oeuvre of Ludwig Baumann (1863-1936) also exhibits Art Nouveau influences. Noteworthy buildings by Baumann include the Imperial and Royal Academy for Oriental Languages (1902; today's American Embassy), the neo-Baroque Ministry of War (1908-1910; Baumann's design triumphed over competing proposals including Adolf Loos' radical solution of a façade done in the colours of the monarchy plus black and gold), the Konzerthaus and the Akademietheater, both done in collaboration with the studio of Helmer and Fellner (1911-1913). Baumann succeeded Friedrich Ohmann in the project to construct the Hofburg, and was responsible for its "Festival Hall" section (from 1910). Fellner and Helmer specialised primarily in theatres, and their studio was active in Austria-Hungary and other European countries from 1873 to 1919. In Vienna, Hermann Helmer (1849-1919) and Ferdinand Fellner (1847-1916) constructed buildings including the revue theatre EtablissementRonacher (1888) and the Volkstheater (1889). Last but not least, the famous outdoor staircase known as the Strudlhofstiege, built by Theodor Jaeger (1874-1943) opened in 1910, and the so-called "Anker Clock" by Franz von Matsch (1961-1942) are also deserving of mention. The clock is part of a bridge between two parts of the Ankerhof, a building constructed for the insurance company Ankerversicherung by Ernst von Gotthilf and Alexander Neumann (1912-1914).